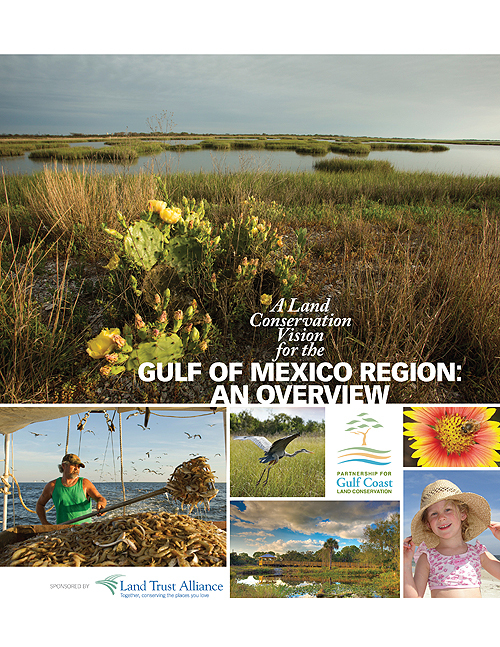 A Land Conservation Vision for the Gulf of Mexico Region: An Overview is a 21-page report summarizing the results and recommendations of the 30 state, regional, and national organizations that make up The Partnership for Gulf Coast Land Conservation. Project responsibilities included researching, writing, and editing all content; identifying and supervising subcontractors for design and copy editing; image research and acquisition; approval of the final print files; and more as needed. 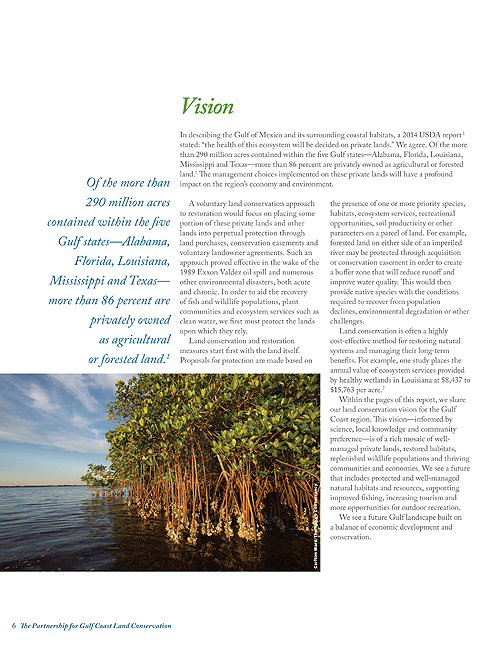 This report provides a vision for a post Deepwater Horizon Gulf Coast region, based on the expertise of the 30 state, regional, and national conservation organizations that make up The Partnership for Gulf Coast Land Conservation. 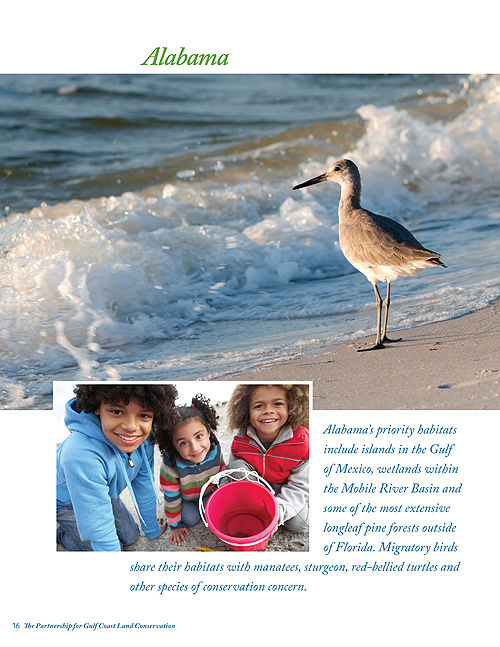 The recommendations within this report will guide land conservation and preservation projects throughout the region, including those supported by various funding sourced provided in the wake of the Deepwater Horizon disaster. 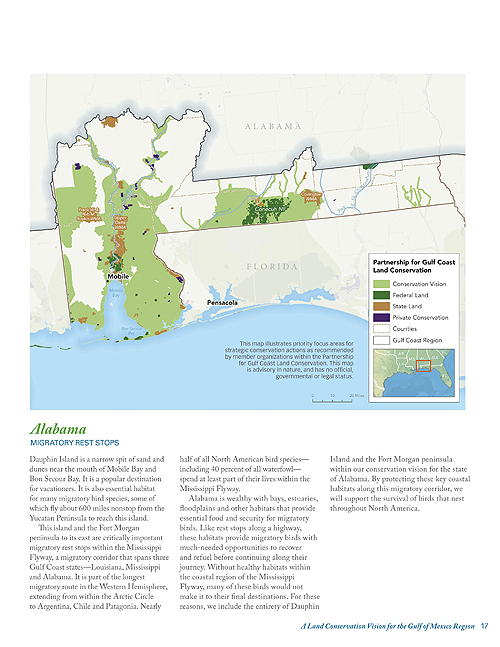 Detailed state summaries and maps included within this report identify the areas within the Gulf Coast region that are of highest priority for protection and restoration of natural areas and resources, as determined by the consensus of the Partnership. These maps provide assistance to local, regional and national land conservation organizations, stakeholders, elected officials, private landowners and others as they grapple with decisions relating to the future of their communities and natural resources. Recognizing the diversity of its audience, this report combines robust land conservation science with simple, easy-to-understand language and visually appealing design. All stakeholders—from land conservation professionals to private land owners—will be able to quickly review and comprehend the recommendations presented within the 21 pages of this report.